Fielding and Kim wanted to make an impact for Hope Reins and they knew funding the covered arena would also be an incredible way to honor their beloved Cameron. Warren’s words are a sobering reminder that the depths of despair can be transformative in God’s hands, and for Fielding and Kim Miller, this knowledge helped shine light along a dark and heartbreaking journey of their own. “She actually called me,” says Kim about Warren. “Kay is an amazing woman with an extraordinary heart.” Even though the international speaker and best-selling author lived on opposite coasts and didn’t personally know the Millers, she offered comfort and support to the family after learning Cameron, their 29-year-old daughter had ended her life after years of emotional struggle. 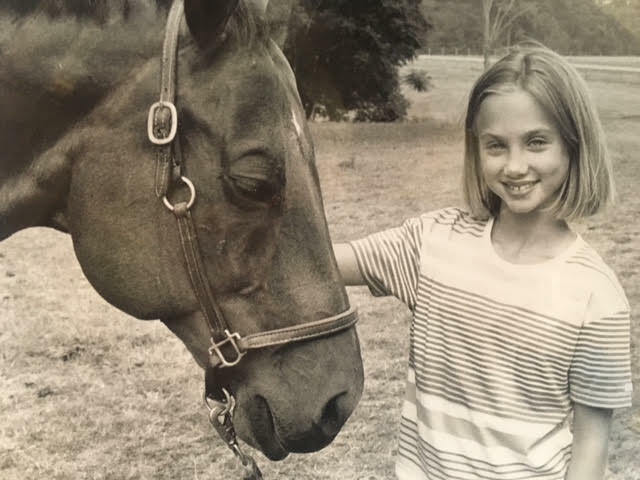 According to the Millers, Cameron’s life really had two chapters, the first of which included many wonderful, early years spent with her prized Arabian pony, Zak. At her funeral, Fielding and Kim honored Cameron’s passion and love for horses by designating Hope Reins the beneficiary in lieu of flowers, and in a remarkable outpouring of love, thousands of dollars poured into the ranch. The family also came to tour Hope Reins and learn more about the nonprofit, its mission and how Cameron’s donations could be used to help kids in crisis. As they walked the property with Kim Tschirret, founder & CEO, she explained the ministry’s growth over the last seven years and shared the significant need for expansion. Tschirret also told them about the lack of shelter for session between kids and horses, and how a covered arena was the critical element needed to serve more kids more often, especially during hot summers and cold, rainy days. Fielding and Kim wanted to make an impact for Hope Reins and they knew funding the covered arena would also be an incredible way to honor their beloved Cameron. “We just feel like it was divinely directed because everything seemed to just fall into place,” says the Millers. Cameron’s Arena broke ground in May and is due for completion by early September 2017. The immense steel structure, wrapped in wood, measures 12,000 square feet. Huge fans, ceiling lights, and electric side walls to enclose the arena, will allow Hope Reins to serve kids and horses year-round, despite fading daylight hours in spring and fall or inclement weather. The Miller’s life – just like Kay Warren said of her own – has been torn down to the foundation. But, God has a plan, and Hope Reins is so amazingly grateful that Fielding and Kim have chosen to build Cameron’s Arena as a shelter for other hurting kids who come through our gate. We thank you for your tremendous generosity, and we will honor her memory always.